Again people who use the Hutt Valley Rail line suffered in their return home last night as travel plans were thrown into chaos yet again as the TransMetro services were disrupted from 4pm yesterday. 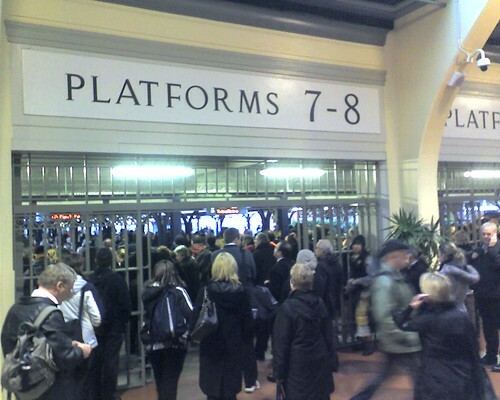 A power fault about 4pm yesterday forced the cancellation of half the peak hour trains (about 100 services) scheduled to leave Wellington railway station last night. Thousands were left waiting on Platforms for non existent trains, and choas rained at peak travel time after 5pm. Thanks to Mike for the photo taken at 5pm at Wellington Station. KiwiRail chief executive Jim Quinn apologised to affected passangers. Transport woes continued again this morning for Hutt Valley train commuters, with a service from Taita being cancelled due to mechanical problems. KiwiRail spokesman Kevin Ramshaw says the cancellation did not cause big problems, as it was an early service. “There are trains going through there all the time because it’s on the Hutt Valley line, so there were alternative trains to take,” he said. It shows clearly that this service is on its last legs, and the apathetic approach Kiwirail have toward current problems, roll on 2010 when the new trains are due. But equally expect further disruptions to integrate this new service as the closing of Epuni Station for six weeks illustrates. Just Hurry Up Kiwirail!